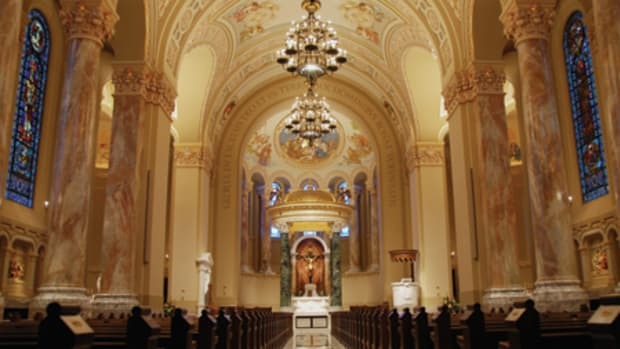 Canning Studios restores and redecorates the Basilica of St. John the Evangelist in Stamford, CT. The Basilica of St. John the Evangelist in Stamford, CT, has a long and colorful history, and recently that story became even more colorful. The interior has been painted in the Victorian Gothic style by Canning Studios, in a three-year, three-phase project. 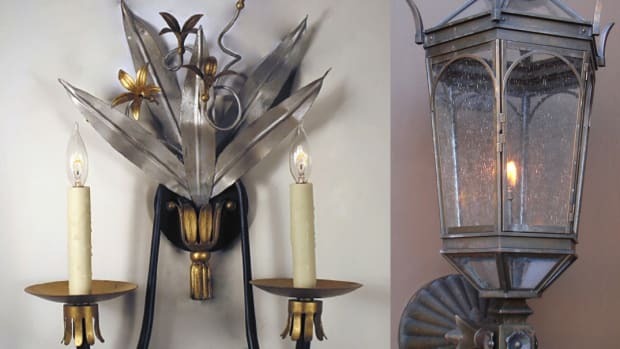 Founded by John Canning in the 1970s, his firm has been decorating and painting church interiors for more than 40 years, but Canning&apos;s experience goes back even further than that. He trained in Glasgow, Scotland, where he completed a five-year apprentice program as a church decorator before founding his own firm and then coming to the U.S. He has completed many projects, including church interiors, over the years, but this one provided new challenges and opportunities. The church was designed by James Murphy in the 1870s for a predominantly Irish parish. He was one of the premier architects for the Catholic Church and he often partnered with Patrick Keely, another prolific church architect of that time. 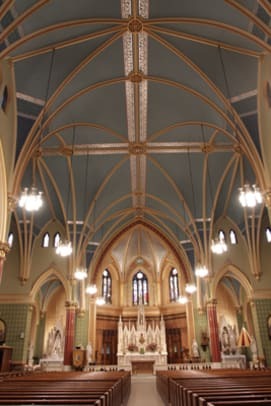 "They designed many churches together and separately," says John Canning, founder of Canning Studios, Cheshire, CT. "This was the first Roman Catholic Church in southern Connecticut and it was designed to lay the groundwork for the Catholic Church movement in the state." The original plan called for the 9,600-sq.ft. church to be built in stone, but the parish ran out of funds when only the basement and lower course of the side walls and transepts were completed. A parishioner named John Ennis, who was a stage set designer, completed the church in 1886. Instead of stone, he used plaster and wood lathing to create a lofty, vaulted ceiling with an upper clerestory also of wood. Large stained-glass windows bring light into the church. On the exterior, hammered tin was used to mimic the carved stone of the lower walls. In the late 1920s, the sanctuary was decorated by another parishioner, Thomas Magee. Meanwhile, the nave and transept were painted many times, but were never decorated. 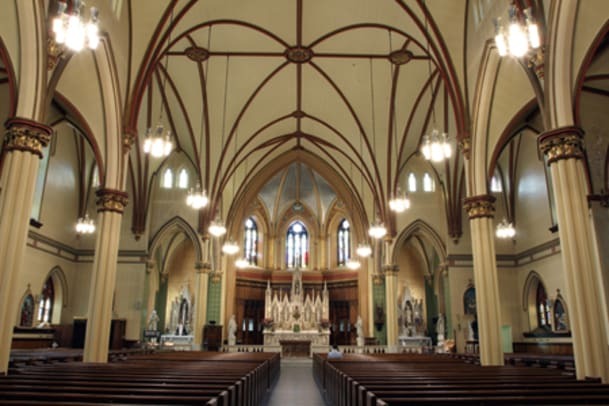 Fast forward to present day and Monsignor Stephen DiGiovanni brought in Canning Studios to complete the basilica by designing a new decorative scheme and artwork for the interior in the Victorian Gothic style. "The client sought from our studio a new design scheme that was authentic in the tradition of Church decoration that would reflect Catholic tradition, symbols, iconography, and support the liturgy," says Canning. Phase one of the project was the re-creation of the sanctuary, following the 1927 design. It was completed in 2009. A paint study was conducted, and areas identified for exposures, to determine the l927 design and palette. "An exposure is the area created when paint layers are removed to reveal examples of the targeted period of decoration," Canning explains. 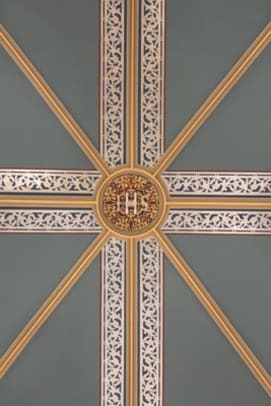 "With this information, the 1927 decoration was re-created, replete with all of the appropriate symbols of the church the four evangelists and Trinity." The sanctuary ceiling was decorated with aluminum leaf, along with silver and blue colors. "It was an unusual use of aluminum leaf," says Canning. "Our challenge was to give this 1920s decoration a Gothic theme." Each of these saints has signature colors in Christian art. St. John&apos;s robes, for example, are painted in his traditional colors of red, green, brown and silver, colors that are also found in the Crucifixion window above the high altar. He stands on the right side of the cross in robes of these traditional colors. The second phase, completed in 2010, was the side chapels. "This is an extension of the sanctuary," says David Riccio, principal of Canning Studios. "Again, we did a paint study to expose the early decoration that was contemporaneous with 1927." The rest of the church, the nave, was the largest part of the project and the most challenging. "Inspired by the sanctuary, we created a new decorative scheme for remainder of church," says Canning. "We had the 1920s decoration that really didn&apos;t have a particular style, so we adapted that and made it fit into the Gothic style." "When it came to the nave, we had already done the sanctuary and the side chapels," Riccio notes, "so we followed that style." One of the most challenging sections was a void along the upper portion of the wall that had been created when the balconies were removed. "The balcony was pulled out in &apos;30s or &apos;40s," says Riccio, "and that void was tremendous. 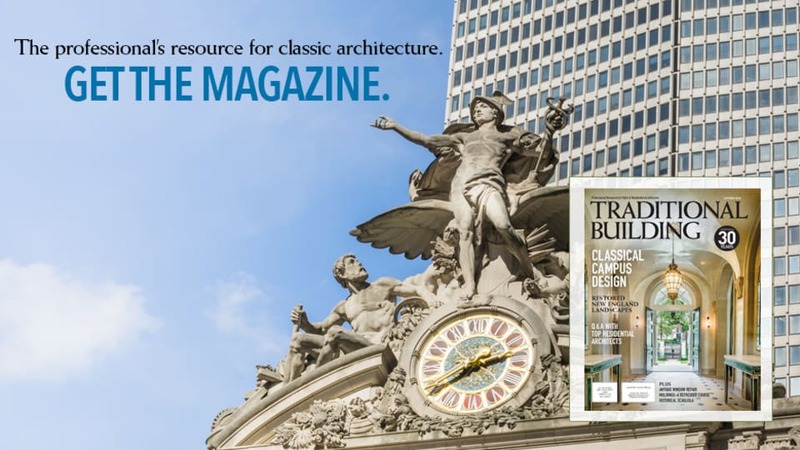 It had a profound impact on the architecture and the way you view the space. The relationship of walls and ceiling was awkward. We considered different options on how to fill that space, including decorative bands and diaper pattern of stencils. They looked fine, but they weren&apos;t striking and they didn&apos;t do much for stained-glass windows." "We had several conversations and meetings with the Monsignor, and we prepared color renderings," Canning notes. "We did renderings on how to fill those voids and developed a color palette, and then settled on a final scheme. The Monsignor wanted us to create something to fill this void and to include as much decoration that would reflect Catholic tradition." The solution that Canning and Riccio developed was to create eight trompe l&apos;oeil niches on either side of the stained-glass windows. Each niche contains a painting of two statues in the grisaille style of painting. They are surrounded by painted architectural molding and columns. Eight saints, including Pope Pius the 9th and St. Patrick, two saints who have special significance to the Irish, are featured. The grisaille style produces a three-dimensional monochromatic life-like image, so it appears that there are eight statues in niches in the upper portion of the wall. "The painting is on a flat surface, but it looks three dimensional," says Riccio. "It is illusionistic painting. It gives the illusion of architectural moldings and columns surrounding the statues," Canning explains. The niches are actually 19 ft. tall, and each contains two 9-ft. tall paintings of statues. A scroll border separates the upper portion of the walls from the lower portion, which is painted with a green background, as a tribute to the founding Irish immigrants. Green and gold vines and shamrocks appear on a dark green background along the side aisles between the Stations of the Cross. The brilliant red and gold colors from the sanctuary are carried into the nave with red columns highlighted with gold capitals and stenciling. The artists were also inspired by the colors in the stained-glass windows, especially the blue in the sanctuary window, and they brought this color into the nave as well, to create harmony in the overall design. The deep blues and turquoise in the sky in the Crucifixion window are repeated in the nave in the ceiling. The turquoise color also highlights the detail in the capitals and emphasizes the arches. And finally, at St. John&apos;s, Canning was able to fulfill one of his goals. 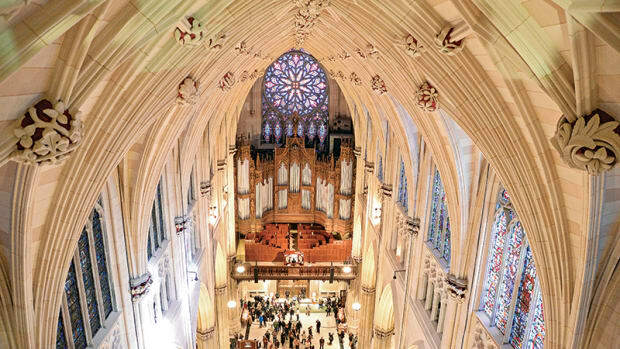 "It was always my hope that I could create a cross in the center of a Gothic church," he says, "and we were able to do it here. When you look up at the ceiling, you see the large silver-and-blue cross that follows the cruciform shape of the church." The colors, including the aluminum leaf, are taken from the ceiling of the sanctuary. In the center of the cross, the letters IHS (the first three letters of Jesus in Greek) appear in the main boss at the crossing. Catholic symbolism continues throughout the basilica. Bosses along the central ribs of the ceiling contain golden pomegranates with red centers, symbols of immortality. In addition, symbols of each of the original Apostles – 11, minus Judas – appear in each arch. Even though scaffolding was in place and 6 to 12 artisans were working at one time, the basilica was always open for services. The main body of the church took six months, while the sanctuary took two months and the side chapels another couple of months to complete. Canning notes that the attitude toward church decoration is changing. "Historically the architecture of churches communicated stories of the faith and support of the liturgy through decorative schemes replete with church iconography. Since the Second Vatican Council, however, Catholic Church design has seen a pronounced departure from that tradition, changing interiors to suit a new liturgy and simplifying the decoration. Decoration was often omitted in new designs for churches, and actually removed or covered up by renovation," he explains. "Today," he adds, "we are now seeing a renewed appreciation of traditions, of symbolism, the importance of color and iconography. I&apos;m excited about this important trend towards a return to the values of church decoration that supports the Liturgy and the services being performed." 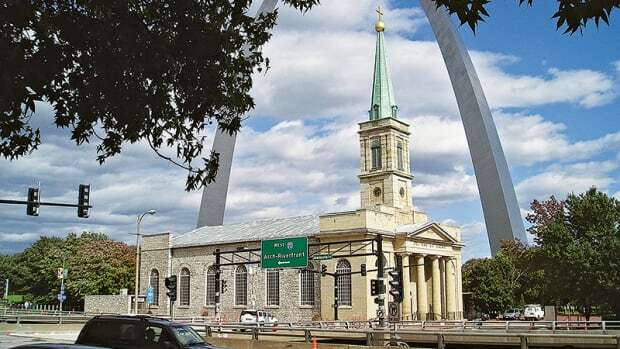 Known locally as "the Old Cathedral" in St. Louis, the Basilica of St. Louis, The King gets a full interior and exterior restoration from Mackey Mitchell Architects.